Marsh, James H.. "Stanley Cup". The Canadian Encyclopedia, 11 April 2019, Historica Canada. https://www.thecanadianencyclopedia.ca/en/article/stanley-cup. Accessed 18 April 2019. 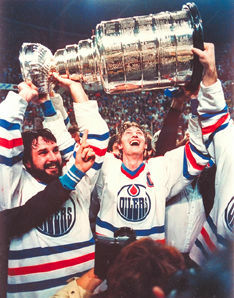 Wayne Gretzky holding the Stanley Cup aloft for the Edmonton Oilers, the most exciting team of the 1980s (courtesy Edmonton Journal). 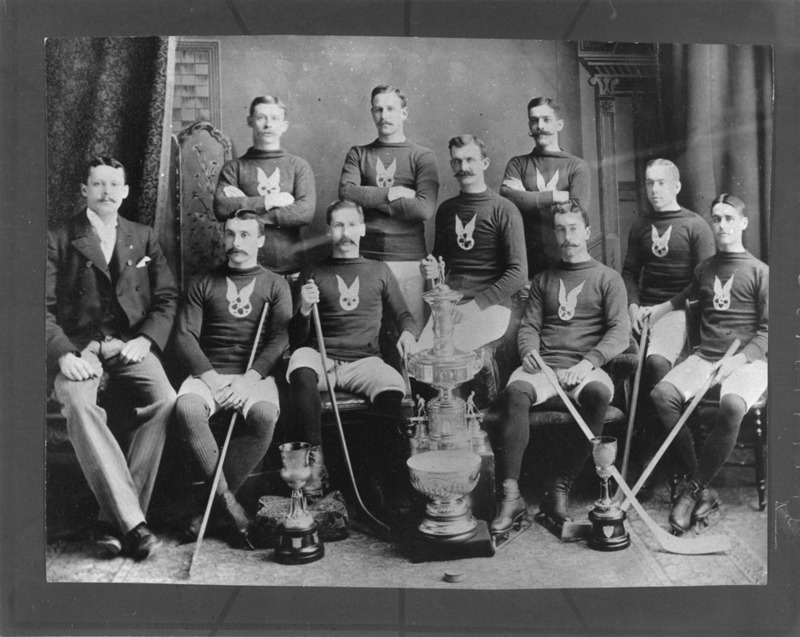 Originally known as the Dominion Hockey Challenge Cup, the trophy began to be known by its donor's name by the mid-1890s (courtesy Canadian Sports Hall of Fame). Stanley Cup at the Hockey Hall of Fame (2008). In 1888, Sir Frederick Arthur Stanley was appointed Governor General of Canada. That winter, he watched his first hockey game in his official capacity as governor general, between the Montreal Victorias and Montreal Amateur Athletic Association (MAAA). According to the Montreal Gazette, “Lord Stanley expressed his great delight with the game of hockey and the expertise of the players.” Stanley wasn’t the only hockey fan in his family: his daughter, Isobel, soon picked up the sport, as did sons Edward, Arthur and Algernon. Organized hockey was still relatively new and only Montréal and Ottawa had regular leagues at the time, but it was quickly becoming a popular sport. 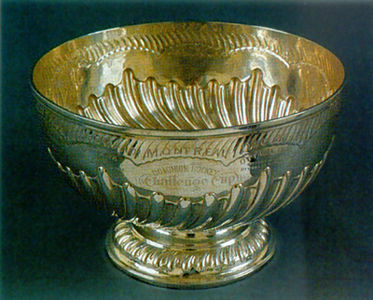 On 18 March 1892, Stanley announced that he would donate a “challenge cup, which should be held from year to year by the champion hockey team in the Dominion of Canada.” He subsequently had a small silver bowl made in London, England, which arrived in Ottawa in early 1893. Originally called the Dominion Hockey Challenge Cup, it quickly became known as the Stanley Cup. The Cup would be awarded by the trustees, the first of whom — Dr. John Sweetland and Philip Dansken Ross — were appointed by Stanley before he returned to England in 1893. Dr. Sweetland, sheriff of Carleton County (now Ottawa), was a trustee until his death in 1907, while Ross remained a trustee until his death in 1949. Stanley had stipulated that winning teams could add a silver ring to the bowl, on which their team names could be engraved (though not all teams chose to have their names engraved during the early years). In 1893, the first recipient of the Stanley Cup — the Montreal Amateur Athletic Association (MAAA) — added a base ring that was used by teams until 1903, when it became too full. From then until 1909, winning teams were engraved on the bowl itself. In 1907, the Montreal Wanderers became the first to engrave the names of individual team members (however, it didn’t become standard practice to engrave individual names until 1924). A new base ring was attached in 1909 by the Ottawa Senators, who won the Cup that year, and many rings were added in subsequent years. By the mid-1940s, the Stanley Cup resembled a tall “stovepipe” and had become unwieldy and impractical. The Cup was, therefore, redesigned in 1947 and again in 1957. 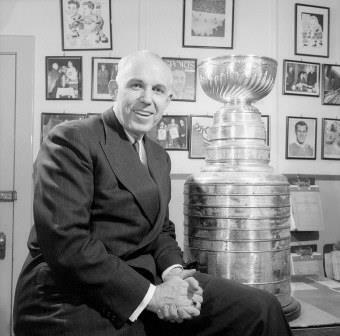 Clarence Campbell, president of the NHL, with the Stanley Cup. The Stanley Cup now includes a replica of the original silver bowl, underneath which sit the bands from 1893 to 1927 and a shoulder collar engraved with the names of all the winning teams from 1892–93 (MAAA) to 1991–92 (Pittsburgh Penguins). Underneath are five wider barrel bands, each with enough room for 13 teams (including the names of individual members). When the most recent band (at the bottom) has been filled, the oldest band (at the top) is removed and retired to the Hockey Hall of Fame. 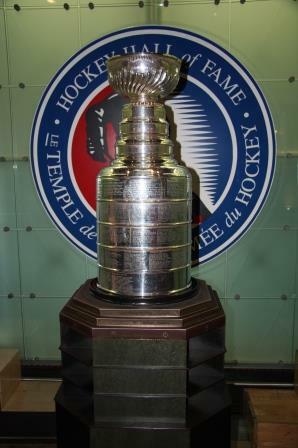 The original Stanley Cup bowl is on permanent display at the Hockey Hall of Fame, as are the bands from the stovepipe design (1927–28 to 1944–45) and the retired bands from the current Stanley Cup design: the 1927–28 to 1939–40 barrel band and the 1940–41 to 1952–53 barrel band. The Hockey Hall of Fame also holds a replica of the current Stanley Cup so that there is always a version available for visitors to view. The actual Stanley Cup is presented to the winning team and, since 1993, each winning player has been allowed to keep the Cup for a day during the summer after their victory. The Cup has had a colourful history and has been lost, misplaced and stolen on several occasions. 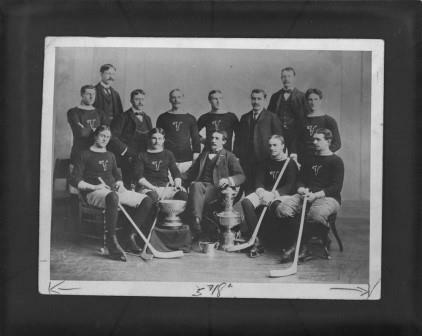 According to the Hockey Hall of Fame, members of the victorious Ottawa Silver Seven decided to drop-kick the trophy into the Rideau Canal after their victory in 1905 — it was rescued from the canal the following day. 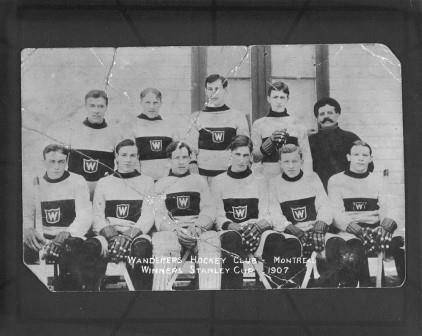 Two years later, the Montreal Wanderers left the Cup with a photographer, whose mother decided it would make a great flower pot — after a few months, the team retrieved the trophy and restored it to its original purpose. In 1924, the victorious Montreal Canadiens mistakenly left the Cup in a snowbank after stopping to change a flat tire on the way to a party – fortunately, they remembered later that evening. The Stanley Cup has also been stolen. In 1962, Kenneth Kilander, a Montreal Canadiens fan, tried to take the Cup from the Chicago Stadium during a semifinal game between the Canadiens and Chicago Black Hawks. In 1970, the Cup’s original silver collar was stolen from the Hockey Hall of Fame and wasn’t recovered until September 1977 — Diomed Karrys, the operator of a dry-cleaning store, was charged with possession of stolen property. A few months earlier, in March 1977, seven students from the Université de Montréal were caught trying to steal the Cup itself as part of a scavenger hunt — the group was released without charges. In 1979, the Cup was “borrowed” by Guy Lafleur after the Canadiens’ victory parade. Lafleur stowed the trophy in the trunk of his car and took it to Thurso, Québec, where his parents lived. While family and neighbours enjoyed seeing the Cup, the trustees weren’t as happy. 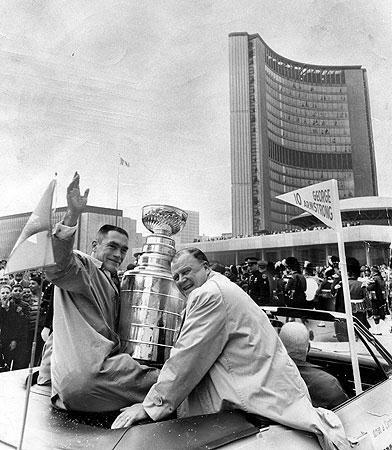 The Stanley Cup was originally intended as an award for the top hockey club in Canada. Known as the Dominion Hockey Challenge Cup at the time, it was first awarded to the Montreal Amateur Athletic Association (MAAA), whose affiliate team — the Montreal Hockey Club — was the 1892–93 champion of the Amateur Hockey Association of Canada. Other teams could challenge the champions at any point during the season. This changed in 1912, when the Stanley Cup trustees decided that challenges could only come at the end of the champion’s regular season. In 1915, the National Hockey Association and Pacific Coast Hockey Association decided that the Cup should be contested by their respective league champions, effectively ending the challenge era. The Montreal Hockey Club was the first team to win the Stanley Cup. In the early years, the Stanley Cup was dominated by teams from Montreal: the MAAA (1892–93, 1901–02), Montreal Victorias (1894–95, 1897–98), Montreal Shamrocks (1898–99, 1899–1900) and Montreal Wanderers (1905–06, 1907–08, 1909–10). However, the Cup was also captured by the Winnipeg Victorias (1895–96, 1900–01), Ottawa Silver Seven (1902–03, 1903–04, 1904–05), Kenora Thistles (1906–07), Ottawa Senators (1908–09, 1910–11), Quebec Bulldogs (1911–12, 1912–13), Toronto Blueshirts (1913–14) and Vancouver Millionaires (1914–15). As hockey increased in popularity, both in Canada and the United States, many teams began employing professional players. In 1906, the sport’s top league, the Eastern Canada Amateur Hockey Association (ECAHA), decided to allow professional players. Two years later, in 1908, the two amateur teams in the league — the Montreal Hockey Club and Montreal Victorias — decided to leave, forming the Interprovincial Amateur Hockey Union. The ECAHA dropped “amateur” from its name and became a professional-only league: the ECHA, briefly known as the Canadian Hockey Association (CHA) in 1910. From that point on, the Stanley Cup became a trophy for professional hockey teams. In recognition of this development, Sir H. Montagu Allan donated a trophy in 1909 to be awarded to the top amateur team in Canada (see Allan Cup). In 1910, the National Hockey Association (NHA) was formed, while the CHA folded.The following season, the Pacific Coast Hockey Association (PCHA), another professional league, began playing. NHA teams dominated the Stanley Cup for four seasons, with the Ottawa Senators winning in 1910–11, the Quebec Bulldogs in 1911–12 and 1912–13 and the Toronto Blueshirts in 1913–14. In 1915, the NHA and PCHA agreed that the Cup should be contested between their two league champions. The 1914–15 Stanley Cup was won by the PCHA’s Vancouver Millionaires, who became the first Western team to take the championship. When the Portland Rosebuds, an American team, joined the PCHA in 1914, the Stanley Cup was transformed in another way. What had begun as a trophy for the top amateur hockey team in Canada had become a prize for the best professional team in North America (and, effectively, the world). In 1916–17, the Seattle Metropolitans became the first American team to win the Stanley Cup. Another important development occurred in 1917, with the creation of the National Hockey League (NHL), which replaced the National Hockey Association. Five years later, the Western Canada Hockey League (WCHL) was created and the format of the Stanley Cup Final was altered: the three leagues —NHL, PCHA and WCHL — would pit their champions against one another in the Stanley Cup Final from 1922 until 1925, when the PCHA and WCHL merged to form the Western Hockey League (WHL). When the Victoria Cougars won the 1924–25 championship, they became the last non-NHL team to win the Stanley Cup. The Stanley Cup Final has only been cancelled twice since its inception: the first time (in 1919) was due to a worldwide outbreak of influenza, and the second time (2005) was due to a labour dispute. The Spanish Flu, which claimed more than 21 million lives from 1918 to 1919, resulted in the cancellation of the Stanley Cup Final between the Montreal Canadiens and Seattle Metropolitans. Both teams had won two games each in the series when most of the Canadiens team became ill with the flu. Many Seattle players fell ill as well. Canadiens player Joe Hall died in Seattle only a few days after the series was cancelled, while team owner and general manager George Kennedy never fully recovered and died in 1921. In 1926, the Stanley Cup came under the exclusive control of the National Hockey League (NHL). That year, the Western Hockey League (WHL) folded and was replaced by the Prairie Hockey League (PHL). However, the NHL had bought up the contracts of the best WHL players and added three American teams to the league. In comparison to the NHL, the PHL was considered a “minor” league and folded after two seasons. The Stanley Cup effectively became the championship trophy for the NHL, the only remaining major professional hockey league in North America. Although other leagues and teams issued challenges for the Stanley Cup, they were not accepted by the Cup trustees. In 1947, the NHL formally gained control of the Stanley Cup. The Cup has been awarded every year since then, except in 2005. In February 2005, the NHL officially cancelled its entire 2004–05 season due to a bitter labour dispute between the National Hockey League Players’ Association and NHL team owners over a proposed players’ salary cap. 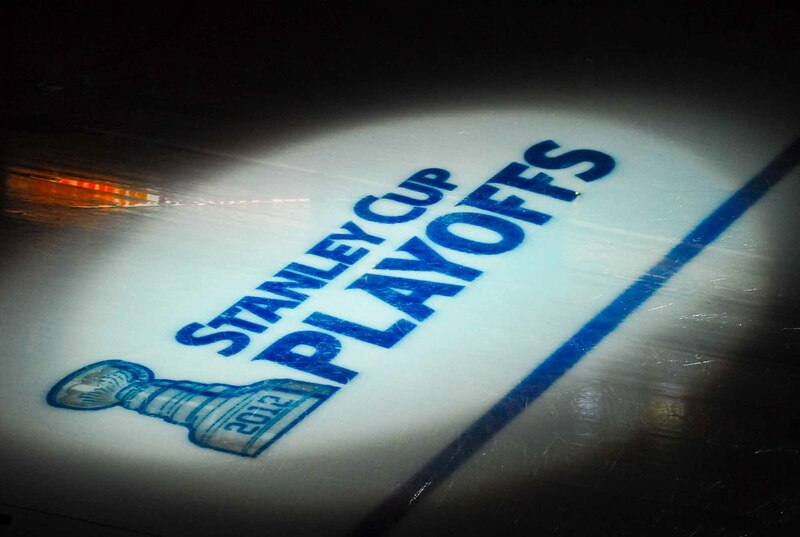 Cancellation of the season rendered the Stanley Cup Final impossible that year. The Montreal Canadiens, with 24 victories (including five straight wins from 1956 to 1960), have been the most successful team in Stanley Cup history, followed by the Toronto Maple Leafs franchise with 13 wins (including one as the Toronto Arenas in 1918 and one as the Toronto St. Patricks in 1922) and the Detroit Red Wings with 11. The first “dynasty” was the Ottawa Hockey Club, which won 11 Stanley Cups between 1903 and 1927: four as the Ottawa Silver Seven and seven as the Ottawa Senators. From 1932–33 to 1940–41, the Stanley Cup was won by American teams: the New York Rangers, Chicago Black Hawks, Detroit Red Wings and Boston Bruins. 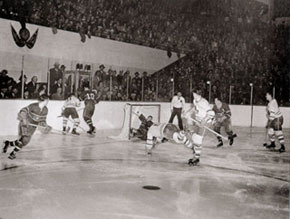 However, from the 1940s through the 1970s, the championship was dominated by the Canadiens (18 wins) and the Leafs (10 wins), while the Red Wings won five times during the same period. In the 1980s, the New York Islanders and Edmonton Oilers dominated Stanley Cup play, each winning the cup four times. The 1990s saw much more parity in the league. The Oilers added a fifth win in 1989–1990, while the Pittsburgh Penguins (1990–91, 1991–92) and Detroit Red Wings (1996–97, 1997–98) managed back-to-back wins. Since 2000, the Red Wings and the Los Angeles Kings (coached by Darryl Sutter) have won another two Stanley Cup championships, while the Pittsburgh Penguins (with star forward Sidney Crosby) have won three. The Chicago Blackhawks have won three championships since 2010 alone, bringing their total to six. Dan Diamond, ed, The Official National Hockey League Stanley Cup Centennial Book (1992).